Last Saturday, January 10. It was the 2nd day of my rest-day from work and the plan to go Ice skating with some friends got cancelled on the last minute. With nothing much to do at home and I was urging to go out, I came across an Event happening on the same day from my Facebook account. The event was named “Talking Apples January POP-up ^_^ Cafe” hosted by Talking Apples of course. Anyway, the location was set at 121 Bar and Grille Restaurant, Allegro Center along Pasong Tamo Extension, Makati. It’s not that hard to go there since I’m kind of familiar with the road anyway. Upon arriving to the venue and entering the glass door, the customer’s were greeted gracefully by one of the staff. All of the staff were on their Cosplay outfits as they serves customer while in character based on who they’re cosplaying. On the front desk, I was greeted by the god “Yato” from Noragami as he [the staff are female but I’ll just address their gender depending on their character] asks what would be my order and will be served in exchange for P5 as an offering to fulfill my request. I ordered 1 “Talking Apple Cupcake” and an OmuRice Set. Then I was escorted to an available seat near the entrance. While waiting for my order, I was greeted by “Himura Kenshin” from Rurouni Kenshin (Ms. Raine De Guzman / Yuuko Ichihara) and also the owner/host of the popup café. I then took the opportunity to ask her some questions about Talking Apples and the initiative behind the idea. She said that the reason behind it was that the staff needed work experience of atleast 250 hours before the official business be put up Katipunan Avenue, Quezon City [I hope this gets a branch around South like BF Parañaque perhaps]. 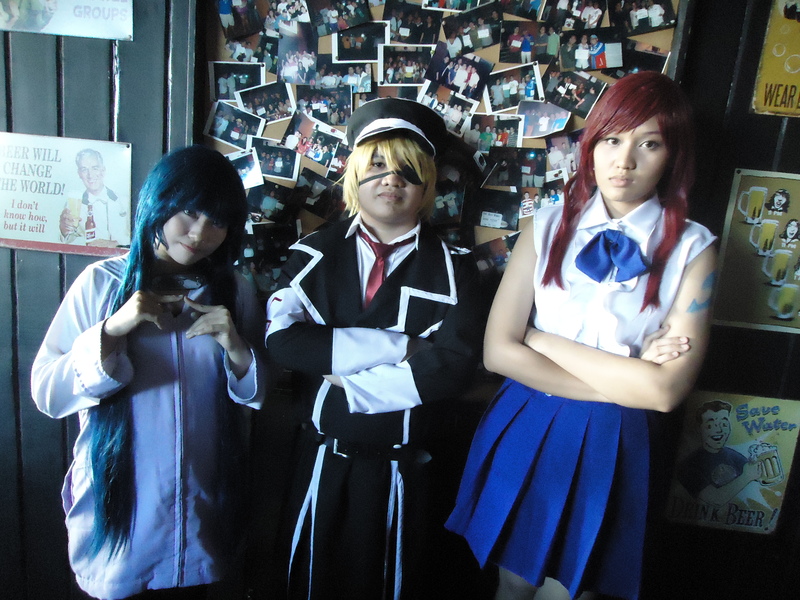 The staffs are dressed-up as Anime characters such as Rei Ayanami from Evangelion, Captain Levi from Shingeki no Kyojin, Erza Scarlet from Fairy Tail as they serve the customers. 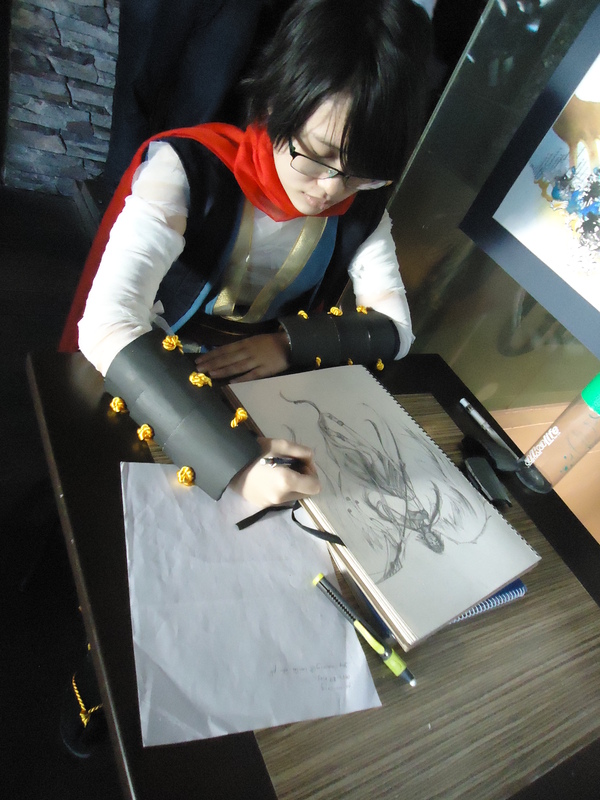 There are also some customers cosplaying characters such Saber from Fate/Prototype and Chōji Akimichi from Naruto. I also asked Ms. Yuuko if we can have a little chat later on so that she can tell me more about Talking Apples which I think she agreed and if we can talk more over beer some other time. After a short while, my order arrives and It was delivered by “Eren Jaeger” from Shingeki no Kyojin (Max) and also asked if I would like him [again the staff are female but I’ll just address their gender depending on their character] to draw/write something on my OmuRice using Catsup, and I agreed on with a smile. [I wish I could have taken a picture while she does it for referenced but I really tend to forget these things as they happen “I’m a failure as a picture-taker”]. She then ask me if there’s anything I need, so I took the opportunity to ask some questions most especially on the food they’re serving. One the things I asked was what is their best seller so far, he then answered that last time, of some unknown reason, their best seller was coffee, but then it was taken out from the menu on that day [now I’m curious, I wonder what kind of coffee was it?]. Then I asked if they have any recommendation and he said that it would be their cupcakes. Afterwards, he asked if I need anything else, but since my food was already delivered, might as well start eating. He also told me if I need something just ask. I then proceed on consuming my meal. 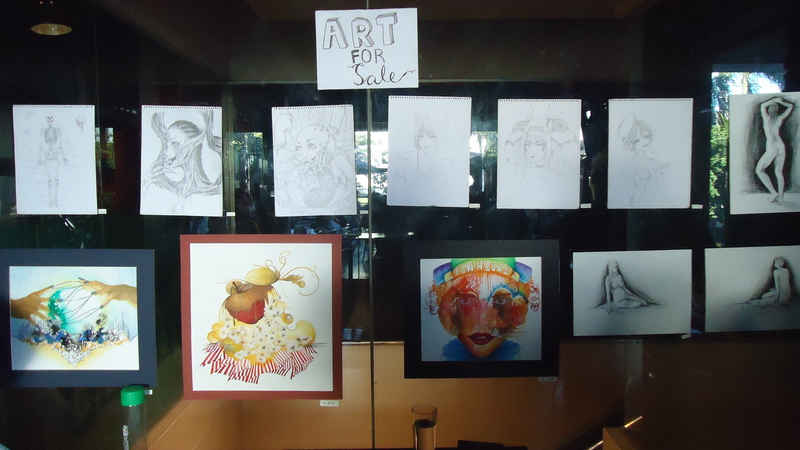 As I look around there’s also an Art For Sale corner near the entrance and the comfort room. Talking Apple Special Cupcake. 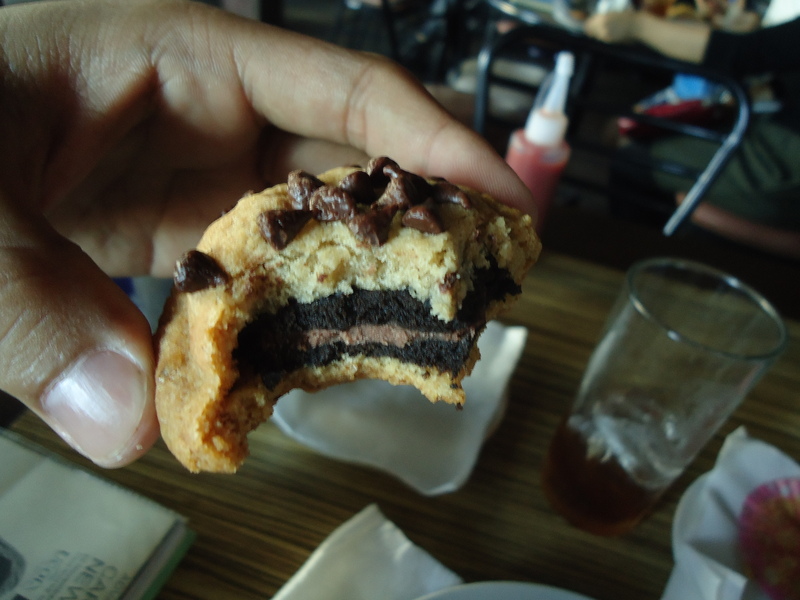 P95.00 | Somewhat spongy, with a taste like peanut buttery and of an apple pie. Not too sweet which I’m ok with it. After eating, I roamed around the venue to take some picture. I would like to know more about Talking Apples, but unfortunately, by the time I finished my food, Ms. Yuuko has gone out to buy some ingredients/supplies so I guess maybe some other time. All in all, the visit was good and I like the idea and I hope it gets official soon. I’ll try to go back next month if I have spare time and maybe bring some friends with me. Next one will be on February 28 with the theme of “Bloody Valentine” and still will be at 121 Bar and Grille Restaurant, Allegro Center. Once again, we are reeling with excitement for one of the most captivating film festivals of the year. With this year’s theme of the “Family”, The Japan Foundation, Manila (JFM) is presenting 16 contemporary Japanese films that deal with various stories of families. The opening film “Homeland” (original title: Ieji) involves a broken family seeking for light and hope in the midst of injustice and desperation. The film was shot in Fukushima which was one of the provinces severely affected by the earthquake and tsunami in March 2011. The film was an official selection of the Panorama section in the 64th Berlin International Film Festival. “REUNION” (Itai Asu e no tokakan) features the story of a man engaged in the funeral business who volunteered his services at the temporary morgue in a high school gymnasium after the Tohoku earthquake and tsunami. Starring AKB48’s Atsuko Maeda as Tamako, a lazy young woman who graduated from a Tokyo university, but when she couldn’t find a job she was forced to return to her father’s home in Kofu and does nothing all day but lounge around and eat. “Until the Break of Dawn” (Tsunagu) is a heartwarming fantasy adapted from the eponymous novel by Naoki Prize-winning author Tsujimura Mizuki. A young man becomes an apprentice “Tsunagu,” an emissary who can reunite the living with the dead for one time only, and grows through learning about the bonds between people. Based on the life of singer-songwriter Ai Kawashima, following her life after her mother’s death. The story revolves around her journey to make her dream come true to be a singer and, among other things, how she used to perform for free on Tokyo’s streets. All films will be shown with English subtitles. Screening venues are at the Shang Cineplex Cinema 2 (July 3 to 13), Abreeza Mall Cinema, Ayala (July 25 to 27) and FDCP Cinematheque, Davao City (July 29 to August 3) and Ayala Center Cinema 4, Cebu City (August 6 to 10). The 2014 “Eiga Sai” is presented by The Japan Foundation, Manila in cooperation with the Embassy of Japan, Shangri-la Plaza and Film Development Council of the Philippines, and supported by WAO Corporation, Akira, SumoSam, Shu Uemura, ClickTheCity.com and Net25 TV and Radyo Aguila. The Eiga Sai is part of the “ Philippines-Japan Friendship Month” celebration. Last Friday night, we went to see a free film viewing hosted by The Japan Foundation. It was a live-action movie entitled “Quartet!” Directed and Produced by Junichi Mimura and was a part the special screenings of the 24th Tokyo International Film Festival on 2011. The free film viewing was held at The Japan Foundation Manila Office inside Pacific Star Bldg. located at Sen. Gil Puyat cor Makati Ave. whereas onlya maximum of 60 people can see the movie due to the limited space available. The movie was about a dysfunctional family. A son who aims to be a professional violist, a daughter who is in bad terms with her parents, a mother who tries to manage her family, and a father who is unemployed. They decided to create a Family Quartet with the hopes that it will bring their family closer again through music. A heartwarming story of a family full of music. The filming took place at Urayasu City where there was severe damage due to the Great East Japan Earthquake and Tsunami back in March of 2011 whereas staff ans civilians worked hard to finish the film. The place is a “no pictures zone” so we didn’t really get any pictures of the place, but inside there was a library where we loitered around. They have a lot of reading materials such educational books, novels, magazines and an awesome collection of manga with such famous titles. All in all it was awesome and a nice watch. We would like to thank The Japan Foundation for hosting the film viewing. We would love to come by and watch again sometime. In celebration of the 2014 Nihongo Fiesta, the first ever Film Mania will be held on the 22nd and 23rd of February 2014, at the Shang Cineplex, Shangri-La Plaza Mall, Mandaluyong City. Admission to the event is for FREE! Aki and Mirai finally defeats the Dreamshade, Beyond the Horizon (or whatever it is called depending on the translations) but at the price that Mirai will also disappear along with it due to her taking / absorbing the dreamshade from Aki to save him during the day of the Lull. ~ not really up high on our list but certainly included on the top. The kouhai’s locked-up Saki and Madarame inside the clubroom so that they can talk privately and to force Madarame to be honest with himself and ultimately have the guts to tell Saki what he really feels about her for the past 4 years. – It took… The whole 1st series with 2 Seasons, 2 OVAs, and the whole season of the 2nd series.. and Finally, the stress was over… We don’t know about you guys but we really liked the series. Kinda reminds us of what we didn’t do back in college that kinda wish we had. Kiri finally decided to make use of Crime Edge’s powers and become a Killer as the descendant of the most evil murderer of all time as he pledge to protect the Queen, Iwai. As Illya wished for power to defeat enemy and save themselves from demise, she unconsciously unlock some kind of latent ability that allowed her to use the Archer-Class card and transforms herself into a Heroic Spirit. – Loli X Illya X Archer. Nuff said. Arata faces the Queen, Wakamiya Shinobu for the finals of the Karuta National Tournament in the Class A division. Touma fights off Accelerator to rescue Misaka-Imouto and put an end to the Level 6 Project. Staz went off to fight Akimu as per deal he made with his brother to help resurrect Fuyumi. – Fandom stiked us again at full force. – All I can say, this scene kinda gave me the shivers due the set of emotions expressed by Mikasa throughout the scene and the seriousness within each lines that really reach right at the Kokoro. One of the most awaited 2nd season for 2014 was announced together with the release of a teaser trailer giving SAO fans a hint of what to expect. Every beginning has an end. And when something ends, one begins…well a lot of them actually. New Titles, New Seasons. Check out what to expect for the new batch of Anime for the Winter season and for year 2014. Click Here to see full version.